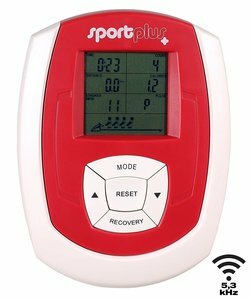 The SportPlus SP-MR-008 is the entry-level variant among the brand’s series of rowing machines. It still has all the qualities of a good rowing machine. It’s durable, it saves space, and it offers a lot of functionalities which will help you attain your fitness goals. 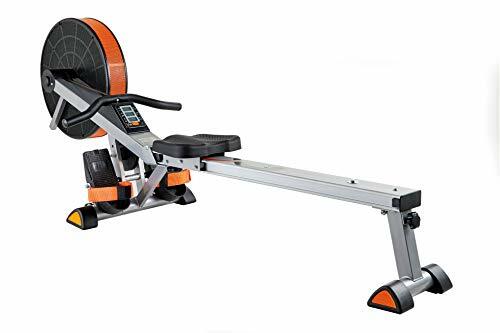 Plus, this model and its higher variant, the SportPlus SP-MR-010 Rowing Machine, can equally hold users of up to 150kg, so you’re sure that it’s stable. – May not work for users above 6 ft.
You don’t need to sign up and pay a monthly subscription to the gym when you can build a gym of your own. The SportPlus SP-MR-008 Rowing Machine is one of the ideal equipment to add to your home gym. It has a high-quality and maintenance-free magnetic braking system that operates quietly. This rowing machine allows you to workout at night without bothering anyone in the house. With its 8kg flywheel mass, you get to have a productive cardiovascular exercise, and if you want to add intensity, you can manually adjust the resistance up to eight levels. The resistance on this model is said to be challenging even on the lowest level, which is excellent for any rowing machine. Working out for an extended period can be frustrating when you feel uncomfortable. The SportPlus SP-MR-008 Rowing Machine has large pedals with non-slip tread surface and safety straps to keep your feet in place no matter how fast you row. This rowing machine is integrated with a comfortable seat that’s made of PU material. The seat slides when you row, although a few people who purchased this item say that it does squeak a little bit after some time. Also, the handles are comfortable to use, but it would be better if they’re slightly bent to allow natural arm movement while rowing. If you’re over 6 feet, you might not be able to fully optimise this rowing machine because it only has an 88cm aluminium rail. However, you can opt for the SportPlus SP-MR-010 Rowing Machine as it has an extra long aluminium track that measures 110cm. When buying home fitness machines, it’s important to note that the display should let you quickly see your progress even while exercising. It’s a good thing that this model has an inclination-adjustable training computer with an LCD that allows you to look at your data from all angles. Even while rowing, you will see your total number of rowing strokes, approximate energy and calorie consumption, stroke frequency, time, pulse, and distance. The training computer also has a pulse belt receiver for standard 5 kHz chest straps, but the chest strap isn’t included. You have to purchase one separately. Building your home gym doesn’t mean you’re going to make your house look like a commercial gym. You can always keep your equipment after you use them so you can enjoy your personal space. Luckily, the SportPlus SP-MR-008 Rowing Machine is foldable, and it has transport rollers on the front stand that makes it easy to move to your storage room. This rowing machine will cost you a few extra money, but it’s worth it. The Hammer COBRA XT Folding Rowing Machine is manufactured by a German established brand that claims 100 years of experience in sports. It solidly built with a 120kg maximum user weight. While the SportPlus SP-MR-008 Rowing Machine offers only eight levels of resistance, this rowing machine offers ten levels of resistance which makes it reasonable for its price. Also, it’s called a “Cobra” because it looks like one when folded! If you’re not convinced, you should look at our detailed review of this model and see for yourself. As stated, it’s foldable, so it’s a great choice even for those who only have limited space inside their homes. If you want to simulate the feeling of rowing outdoors while being in the comfort of your home, you should keep an eye out for air rowers. 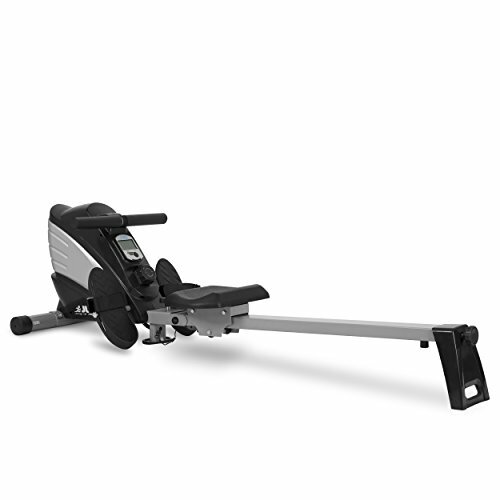 The V-fit Tornado Air Rower is an affordable indoor rowing machine that uses air for resistance. With air rowers, the resistance depends on how fast you row. So the faster you row, the harder the resistance you generate into the fan of the rowing machine. This air rower is made of a robust steel frame, and it comes in an orange tone which is unusual for fitness machines. This rowing machine comes with deep heel cups and thick velcro straps to comfortably rest your foot while working out. 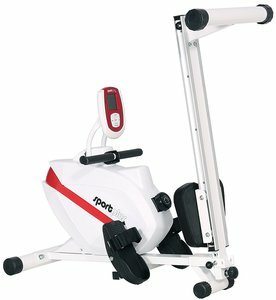 Moreover, the V-fit Tornado Air Rower has an ergonomically shaped handlebar which allows you to generate more air resistance. It also has a built-in LCD exercise monitor where you can monitor important data such as strokes per minute, theoretical distance, calories burned, time, speed, and total strokes. 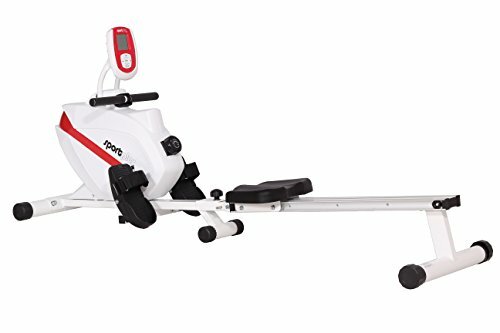 This indoor rower can be folded, and it has integrated roller wheels on the front which makes it easy to transport to your storage room. 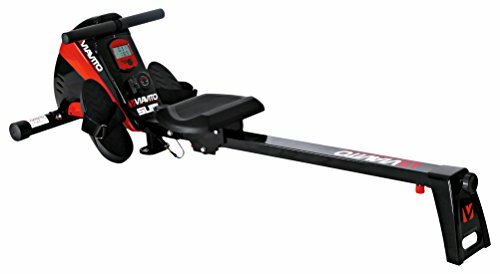 The Viavito Sumi Folding Rowing Machine is indeed a more affordable machine when compared to the SportPlus SP-MR-008 Rowing Machine. However, expect the fact that it has fewer features, it’s still a good buy. It has a tubular steel frame and a maximum user weight of 120kg. It’s also not suitable if you’re very tall as it only has an 80cm aluminium rail. Nonetheless, the Viavito rowing machine is still a durable piece of fitness equipment for its price. It’s also foldable, has ten levels of resistance, and it has a clear LCD display that shows all your important data. 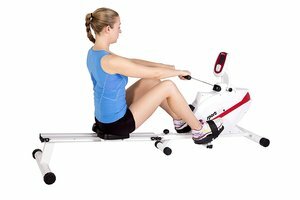 This indoor rower is offered at a very low price but its features are actually impressive. The JLL R200 Rowing Machine has ten levels of silent magnetic resistance, but it can only hold users of up to 100kg. It’s easy to assemble, and it also saves a lot of space in your house as it’s compact and foldable. 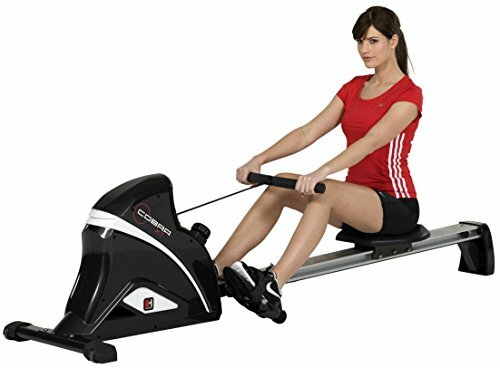 This model is a great choice whether you just want try out indoor rowing or if you’re already a pro in this type of exercise. If you want to know more about this product, you can click here. Settling for more affordable home fitness machines may be practical, but their quality may be compromised. For an entry-level rowing machine, the SportPlus SP-MR-008 is expensive when compared to other brands but it surely gives good value for your money. It has eight levels of magnetic resistance, and it provides a comfortable yet effective cardio workout. Likewise, you’re also guaranteed that it’s durable as it’s made proudly made from Germany.